A professional snow removal team will help get your business operating again as soon as possible. As the holiday season approaches, most business and commercial property owners are on the lookout for the first snow. Old man winter can be a big burden on business owners as they attempt to minimize downtime and keep lots and sidewalks safe for their customers. That’s why many businesses choose to hire a professional snow removal team. When it comes to dealing with winter weather, safety for employees and patrons is going to be on the top of your list of concerns. 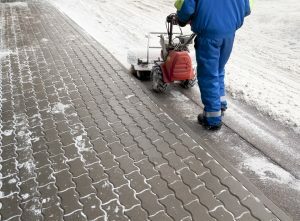 Icy conditions can cause slips, falls, and other injuries. In addition to the injury, litigation that follows these sorts of accidents can cost your business in time, money, and headaches. Accident-related lawsuits against businesses are at an all time high. No one wants to see someone get hurt from something that could be easily avoided. Hiring a professional snow removal team that’s trained and equipped to handle snow removal helps reduce these risks. Many business owners overlook the nuances of a snow removal job. Consider the potential damage that untrained plowing can do to your lot. At Edward’s Lawn & Home, we understand how to maintain and preserve asphalt surfaces so that they are not marred by the plow’s blade. Whether you own a storefront or a rental property, professional snow removal ensures that clients and tenants are kept happy and safe. While you might think it’s economical to do snow removal yourself, that is not always the case. Hiring a professional snow removal team that’s properly equipped for snow removal means the job will get done faster and more efficiently, minimizing potential downtime for business. It also takes the pain of managing the problem out of your hands, so your business can focus on doing what it does best. Need help with snow removal this winter season? Don’t get caught out in the cold! When winter weather hits, Edward’s Lawn & Home can help Maryland business owners get up and running again as quickly as possible. Our snow removal services are efficient, professional, and thorough, so you can trust that your commercial property will be in good hands, no matter the weather. Get in touch with us today by calling (443) 341 6539. You can also check out our portfolio or connect with us on Facebook, Twitter, LinkedIn and Google+. This entry was posted on Wednesday, December 21st, 2016 at 11:41 am. Both comments and pings are currently closed.